FRP duct rod is mainly composed of fiberglass layer and polyethylene protective layer, with high strength, high flexibility, anti-aging, acid and alkali resistance, anti-aging characteristics, usually used in the deployment of power cables, power cables, cables and other lines , Can greatly improve work efficiency. The use of glass fiber reinforced plastic duct rodder has a professional code of practice, if not used correctly, there will be a variety of problems, the following let the professional glass fiber threader manufacturers for everyone to introduce it one by one. 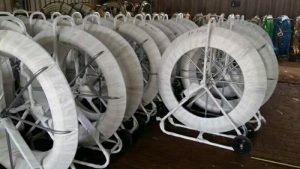 1 Abrasion problems, prolonged use of fiberglass duct rodder can not afford to wear it, because it is made of glass fiber reinforced layer and high pressure low density polyethylene protective layer. Back and forth in the pipeline interspersed with production, wear and tear, it will inevitably damage the protective layer. 2 Corrosive problems, we all know, in the strong acid environment easy to corrode the surface of the object. This is related to the environment in which the FRP duct rodder is used because some acidity may necessitate the establishment of communication facilities where power cables and communication cables must be laid so as to erode the surface of the threader. 3 fracture problems, most of the fracture with the operator’s incorrect use of underground cables are criss-cross, so at some corners, if not careful if it will cause the FRP duct rodder rupture.